Presented by history and global studies teacher Peter Gunn during The Williston Northampton School’s all-school meeting on September 19, 2012. Good morning. A few of you have already heard what I am about to share, but I believe the two anniversaries of this week deserve a wider audience—and a moment of silent reflection and appreciation in our community. Over the past 225 years this document has served our nation well and contributed to positive political developments around the world. Presented by Head of School Robert W. Hill III during The Williston Northampton School’s 172nd Convocation on September 14, 2012. It is one of my greatest pleasures and honors to award faculty chairs—those named, honorary positions that come with a five-year stipend thanks to the incredible generosity of donors to the school. This year, we have two presentations. 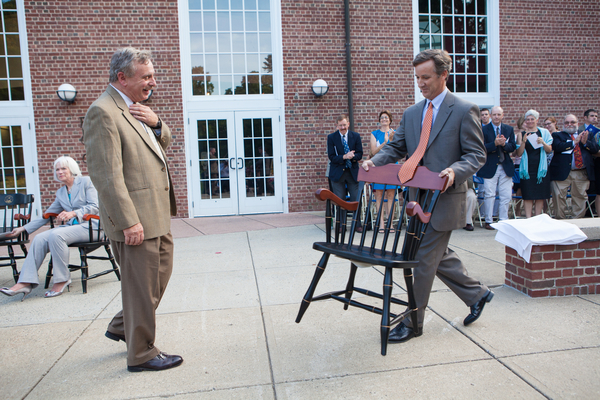 The first, the Hagedorn Family Faculty chair, is presented in absentia to Harris E. Thompson, member of the English Department since 1987. The second faculty chair this afternoon takes on even greater significance, because it represents the inaugural award of a newly funded chair named after someone who is here with us. 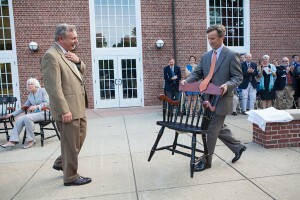 The Richard C. Gregory Faculty chair, made possible through the generosity of donors, some of whom are present, honors Mr. Gregory’s 43 years of teaching, advising, and dorm parenting. Mr. Gregory, whose company we still enjoy in the dining commons, is an accomplished musician and composer, and is legendary among decades of former Caterwaulers whom he led so successfully while they were students at Williston. 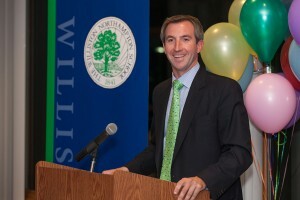 Remarks delivered at The Williston Northampton School’s Senior Dinner on September 14, 2012, by Tim Murphy, Director of Placement at The Fessenden School. Thank you Mr. Hill, Elizabeth D’Amour, faculty, and members of the Class of 2013. It is hard to express, after spending 13 years of my life at Williston, what it means to me to be invited to speak to you today. I don’t think I’ve been this nervous since my freshman English class in 1992, when I addressed the assembled school community in the Chapel about Gov. Bill Clinton of Arkansas! When I told my dad in passing a few weeks ago that I’d be speaking at Williston, he became quiet and looked out the car window for a few moments. He then recalled dropping me off outside the Williston Middle School on my first day of 7th grade in 1990. As I walked, apprehensively, away from the safety of his car and towards that front door, I stopped, briefly, turned back, and shot him a nervous smile, feigning confidence and enthusiasm. My dad, not believing my face for a second, prayed that I would survive. “That you would thrive,” he told me later, “didn’t even occur to me. I only wanted you to survive.” Survive I did. And if you will indulge me a brief trip down memory lane, I’ll give you some background. The Director of the Middle School, with whom I immediately connected, was a kind man from Zimbabwe named Desmond Pullen. My math teacher was the ever-patient, always positive, Mimi King. My English teacher, who pushed me hard to become a good writer and forever eradicated the word “um” from my vocabulary, was Paul Sonerson. Sitting in the classrooms of these dynamic teachers, I soon forgot about my unhappy elementary school experience in a rigid parochial school, and reveled in a school environment where teachers sought my opinions, joined me at my lunch table if I needed extra help, and delighted in my quirky sense of humor. I was hooked. My life would never be the same again. As The Williston Northampton School gathers together for this opening school year, we have an opportunity to have a few moments of reflection. Although this is obviously not the real beginning, it is the formal beginning as we convene to celebrate the start of school. A year ago, I asked that we reflect on where we are, where we have come from, and where we expect to be metaphysically at the end of the school year. This year, I offer a different theme, just because some things are new while others stay the same. I got into an R mood last year, and I decided to stay with it this year. I wanted to think of revelation, not in the sense of the last book of the New Testament in the Bible, but in the sense that we all had some experiences this summer that offered a new perspective on life. In the next nine months, until the closing ceremony of Commencement—the graduation of seniors—that we prepare ourselves for revelations that will come during the year. 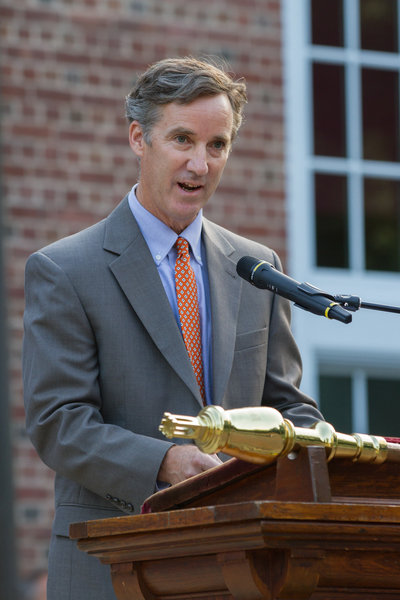 I want to extend a warm welcome to The Williston Northampton School classes of 2017-2013, to faculty and staff, parents, trustees, and to honored guests. This afternoon’s Convocation marks the official start of our 172nd year. This summer, as I was re-reading the school history of the founders, Samuel and Emily Williston, I realized again that theirs was an improbable journey. Having had all four of their children die from the various viruses that proved so deadly to children before penicillin, Samuel and Emily Williston’s surrogate child was the institution that was your alma mater. As Mr. Ketcham explained to us last Sunday—and all of your propelled us along with a Willy-rendition of the rock anthem, “Don’t Stop Belivin'”—we are all on personal journeys. So, in the spirit of the ninth grade’s reading of the Odyssey and Mr. Ketcham’s song selection, I wanted to expand on this notion for a few moments.